The Chukotka housing projects SCP-XXXX is located in are to be monitored. Unauthorized individuals attempting to enter its vicinity are to be questioned, amnesticized, and released. At no point, when not testing, will anyone be allowed within the room containing SCP-XXXX. 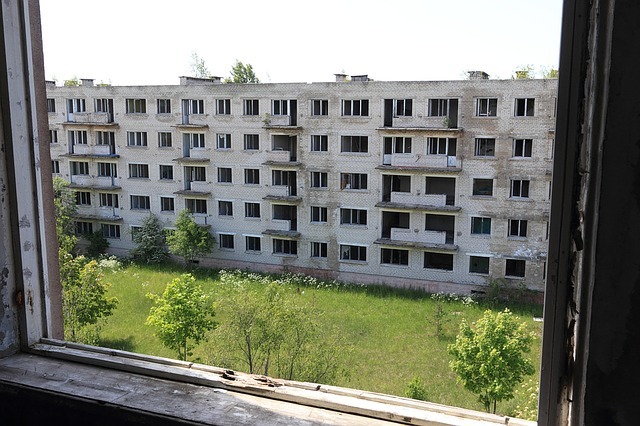 Description: SCP-XXXX is the fifth-floor window of room 526 in an abandoned housing project located in Chukotka, Russia. From outside, no anomalous phenomena are evident and the interior of the building is unremarkable, as SCP-XXXX is the only anomalous item in the building. Individuals viewed through SCP-XXXX, designated SCP-XXXX-1, appear emaciated, bald, and pale to those inside the building. Subjects have additionally noted that observed individuals display involuntary jerking mannerisms. Individuals looking through SCP-XXXX from outside do not view those inside as emaciated or pale. Additionally, SCP-XXXX-1 will remain visibly unchanged and can be interacted with normally if not seen through SCP-XXXX. SCP-XXXX exhibits a constant visual effect on those who have looked through it, designated SCP-XXXX-2. The effect, however, is only constant if SCP-XXXX-2 is to verbally communicate with SCP-XXXX-1 through the window. Upon this criterion being met, SCP-XXXX-2 will be unable to understand speech from SCP-XXXX-1, hearing it as raspy groans, and will view them as if they were looking through SCP-XXXX. This can have detrimental effects on SCP-XXXX-2's mental health, leading them to believe SCP-XXXX-1 is hostile towards them. Foreword: Researcher Golovin, D-9914, and D-7629 were equipped with body cameras and communication devices. Golovin: 7629, 9914 check in. Golovin: Okay, D-9914, please proceed to the marked zone. Golovin: D-7629, proceed inside the building and follow the markers. D-7629: What am I looking for? Golovin: Just follow the markers. D-7629: So I'm in a room. Golovin: D-7629, tell me what you see through the window. D-7629: Gotcha. Uh… there's trees and some grass and— holy hell '14. You're bald! D-9914: What? No I'm not jackass. D-9914: Can you not see from up there or something? D-9914: Where exactly are you up there, anyway? D-7629 begins tapping on the window. Golovin: D-7629 stop tapping on the window. D-7629: Uh… right. So what were we trying to accomplish? Golovin: This concludes test number one. Foreword: The following describes the events leading to SCP-XXXX's neutralization. D-7629: Go in the building, follow the markers, look out the window, don't tap on the glass. Got it. Golovin: Your early release specifies good behavior. D-7629: Right, sorry. I'll head up now. Golovin: Observe D-9914 through the window. Tell me what you see. D-7629: Same as last time. '14 down there's bald. Looks really skinny. And pale. You okay man? D-9914: What are you on about? I'm fine. Golovin: Try to get D-9914's attention from your position. D-7629: Can't I just… you know, do it through the comms? Golovin: No. Yell through the window. Make sure D-9914 can hear you from your location. D-7629 begins yelling at the window. Golovin: Can you hear him? Upon entering the building, D-9914 begins looking for D-7629. D-9914: I'm coming up '29. D-7629 is unable to D-9914's speech. D-7629: Oh my God, he's one of those things now, isn't he? I thought this only worked through the window. D-9914: One of what, man? I'm coming up, so calm down. D-7629: Golovin get me the hell out of here. D-9914: '29 what are you on about? Golovin: D-7629, that is D-9914. He is not going to harm you. D-7629: Golovin I don't care what the hell you say, I am not going near that thing. I'm hiding in this damn building. Golovin: D-4755, please enter the building and assist D-9914 in retrieving D-7629. At this point, D-4755 has walked in view of SCP-XXXX and D-7629 sees him, making D-4755 an instance of SCP-XXXX-1. D-7629: Oh my God, there's more! D-4755 hears D-7629 from his location. D-4755: Uh Golo? I think I just heard him up there. D-7629: Oh, not the groaning again. Golovin: Notify me when you've found him. 3 minutes pass as D-7629 hides within the SCP-XXXX's room. D-9914 and D-4755 spend this time looking rooms on lower floors. D-4755: This might sound obvious, but maybe he's in there with the window? D-9914: Christ, that should've been the first place we checked. D-9914 and D-4755 go to the fifth floor and approach room 526. D-7629: Golovin, please. I can hear them right outside the room. Send some guys with guns in man, they're going to kill me. Golovin: They are not going to harm you. D-9914 and D-4755 appear in the doorway. D-9914: Aw hell, you were right. D-4755: Come on man, let's head back down. D-9914 and D-4755 walk closer to D-7629. D-7629: No no no no. Back off! D-9914: What the hell is wrong with you? D-7629: Golovin please… they're blocking the door, I can't- I can't get out. Golovin: They are not hostile, D-7629. D-7629 picks up a brick and breaks SCP-XXXX. D-7629: I- it's the only way out. D-7629 jumps through SCP-XXXX and falls five stories to his death. Golovin changes his comm frequency. Golovin: I need assistance at Area-194. Despite numerous attempts to convince D-7629 that D-9914 and D-4755 weren't going to kill him, he firmly believed they were hostile. 1. SCP-XXXX was previously Safe. WHAT DO WE REALLY SEE?? ?